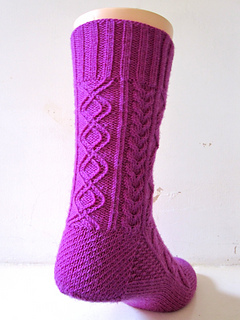 A sock featuring some classic Bavarian twisted stitch motives, many of which have been collected in the three excellent volumes of ‘Baeuerliches Stricken’ by Lisl Fanderl. I have named this design for her husband Wastl Fanderl, who was a prominent figure in collecting, curating and furthering traditional alpine music. 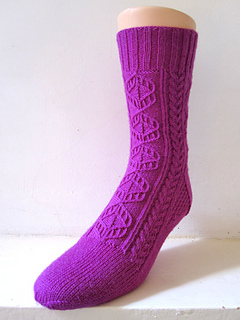 There are two versions of this sock, A and B, so it is up to you if you would prefer one or the other or work a fraternal pair. 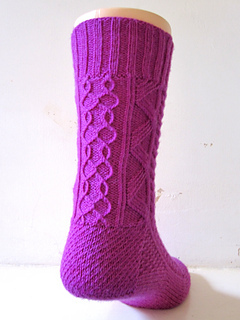 As with most of my patterns, there has been no test knitting apart from the sample I worked myself, so please let me know if there are any problems or mistakes in the instructions. UPDATE 16/12/2014: new version uploaded as some of the numbers in the heel turn were wrong - sorry !